I’m a fan of The Oatmeal so it makes sense that I liked The Terrible and Wonderful Reasons Why I Run Long Distances. I used to like The Simpsons. I thought How to Lose a Marathon was meh. Inman’s book is good because in the midst of all its Oatmeal stuff there’s some decent thought put into the stuff that got me hooked on running in the first place: the mental stuff. You can read a version of it online (for free) here. Before I read How to Lose a Marathon I couldn’t identify a Cohen-written Simpsons episode if my life depended on it. Now I could at least make an educated guess that if the episode tries really really hard to be funny but just isn’t all that funny and actually gets pretty annoying what with how hard it’s trying (and failing) to be funny then there are decent odds said episode is written by Cohen. I think that when I was first starting out running I would have liked Cohen’s book if it was funny. I just didn’t think it was funny. 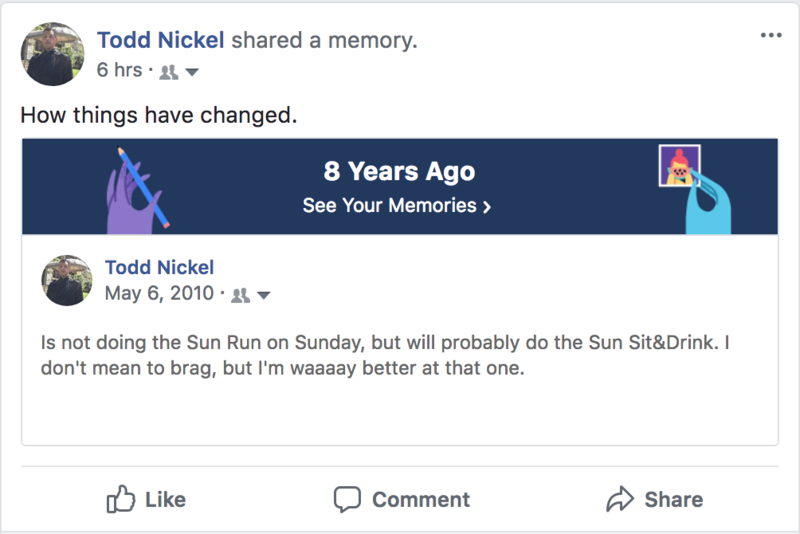 This morning I woke up at 4:45 AM and made coffee and prepared to race 21.1 KM and checked Facebook On-This-Day because I’m a masochist who likes coffee. Sometimes there’s a gem. This would be my second run of the BMO Half Marathon, the first being 2016, which was also my first half marathon. I remember not really knowing what I was doing. If only I’d read a book…. Back then I wanted to run 5 min/KM for a nice round 1:45 and then worry about the last 100 metres later. Stephanie was kind enough to have explained to me what a pace bunny is (and tapering, which I recall thinking seemed ridiculous). So with around 7 KM to go the 1:45 pacer passed me, which was demoralizing at the time. I hung on for a bit before finishing 1:46:00. Fast forward to this morning. 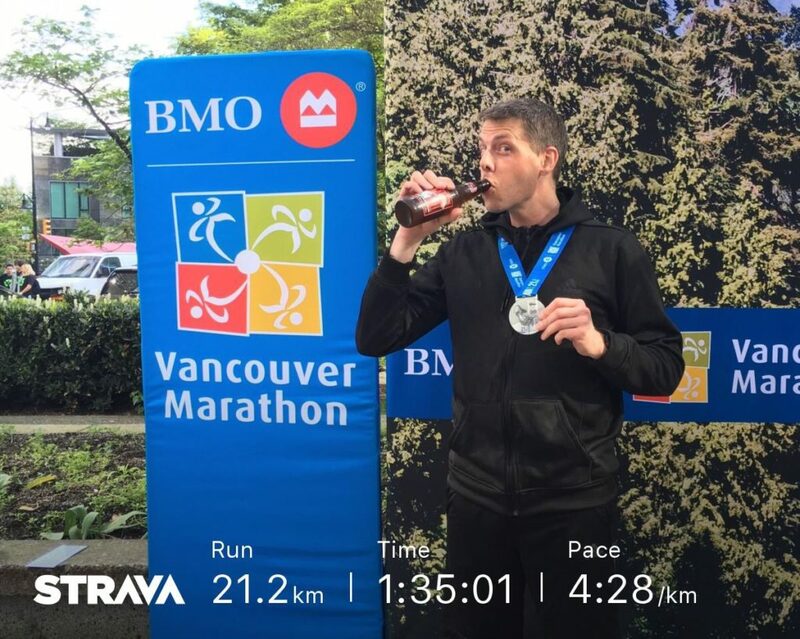 I really wanted to set a new personal best; I aimed for 4:37/KM— that would get me a new PB with a minute to spare and is my Boston Qualifying marathon goal pace. Then I saw the 1:35 pacer in the start corral, and thought, sure, what the hell. The course starts out fast with nearly 100 metres of descent over the first 4 KM. I passed 5 KM over a minute and a half ahead of goal pace. By 10 KM I’d stopped checking splits, but there’s a timing mat and gun-time clock. It read 43-something*** and I knew I was still well ahead of my goal, but wasn’t sure where the 1:35 pacer was. We entered Stanley Park and passed Lost Lagoon and started the climb up Pipeline Road and he passed me. Pipeline peaks at 15 KM then descends to Stanley Park Drive. I checked my time at 15 KM. My personal best I was chasing I’d split 15 KM at 1:10:00. My watch read 1:06. The seconds didn’t register the math did. I could run the last 6 KM at 5:00/KM and set a new personal best. And let the pacer beat me. Again. So I passed him back and held on with all I had left. Just before the lighthouse at Brockton point, with just over 3 KM to go, he passed me again. I fought to keep him in reach as we exited the park, up Denman, east onto Georgia, a slight left onto Pender and the gentle, cruel uphill slope to the finish. I watch that stupid hat with the stupid ears bounce away in front of me and then I saw the finish line and the clock at it read 1:34 and the seconds ticked up as I ran by. I finished with an official time 1:34:52 for a new personal best by 3:35 and 11:08 faster than my first half marathon. This is the second time in as many races that the pacer I’ve chased has been ahead of pace. I’ll take that over the alternative any day. Right up until the start at 7 this morning I was a bit bummed not to be running the full marathon. Not anymore. ***I saw the 10 KM clock. It said 43:something. I remember because my second fastest 10 KM race time is 44:06. My official time at 10 KM today is 44:19 but I swear to dog that clock said sub-44. This isn’t the first time this has happened. I do not understand.